Following on from the Bunting Jumper Refashion I updated a version of the grey jumper for myself using a much simpler method. I simply added a few strips of lace following the sleeve seams. 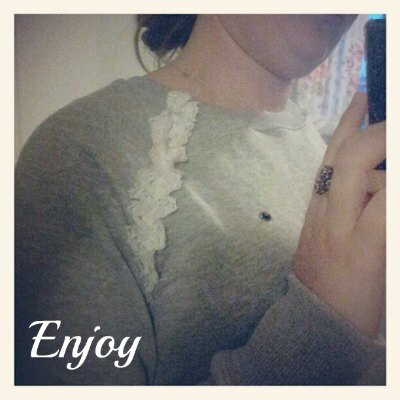 This is a very simple refashion but it makes a plain and simple jumper that little bit more feminine. 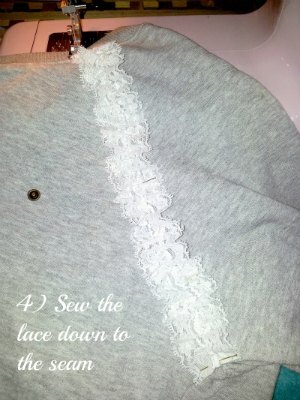 1) Take a simple jumper and some lace ribbon. 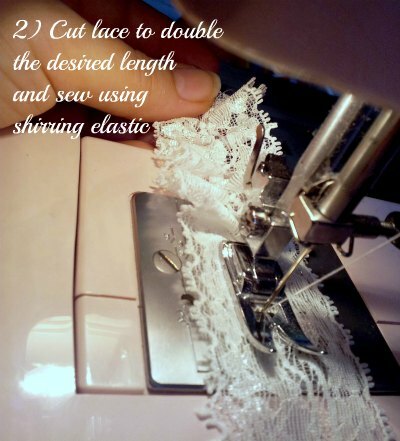 You will also need a sewing machine, thread matching your lace colour, and shirring elastic. 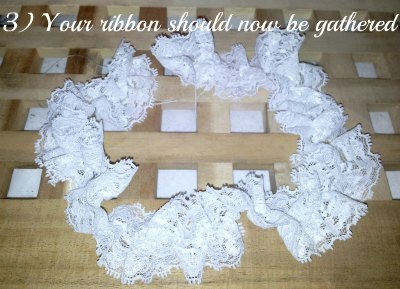 2) cut the lace to double the length of the seam you wish to cover and then sew along the centre of the ribbon using shirring elastic to create gathers. if you do not have shirring elastic or don’t feel confident using it you could create pleats or use a running stitch and pull the bobbin thread to gather the stitches. 4) now pin and sew the ribbon strip down to the fabric. This should be done with a simple straight seam. if you think that the area will get a lot of stretch then you can use a small zig zag stitch. Voila, a slightly more feminine jumper. Super cute! Lately i'm obsessed with anything Lacey. I found a great bit of antique lace at a thrift store recently. I'm thinking I'll turn some of it into a cool necklace, but the rest maybe i'll try something like this. What a simple, and yet perfect idea! Now it gots very elegant look. I`ve found your blog very interesting, I`m a follower now.